Oliver Lynton-Wolfe is a Niantic Researcher and a Sensitive. He is mostly known as the creator of the Ingress Scanner and most of the early XM Constructs related to it. He had been working within Hulong Transglobal, assisting them in their Dark XM research until he was recruited to join Niantic by Zeke Calvin. At Niantic, he was the chief XM engineer. His vast knowledge on XM allowed him to create the Ingress Scanner as well as the first XM constructs, the Resonator and XMP Burster. Following Niantic he had jumped ship with Calvin and was employed at IQTech as their chief XM engineer, creating the Heat Sink Portal Mod. On August 5th, 2013, he defected from IQTech to work alongside Jarvis after speaking to him and learning of his mission duringOperation Cassandra. However, the two of them had a supposedly fatal fight in D.C. and to this day it remain unclear exactly what happened. One thing was certain though: Lynton-Wolfe held a radically different view of the Enlightenment then what Jarvis believed in. Then, at the start of 13MAGNUS he worked with Hulong and tried to kill Jarvis in Bangkok but failed, causing the former to Shard into 13 pieces. Throughout the Anomalies, he would attempt to leverage every possible chance to destroy Jarvis in a mission to succeed Jarvis as the leader of the Enlightened, even going as far as to align with the Resistance temporarily under the idea of them and him sharing a common enemy. However he failed at the end, ultimately mending ties with Jarvis. During the Interitus Anomaly Series, he escaped Jarvis’ compound to help Hank save his memories during Intertius and then moved onto work with Visur until the Shonin event. He has always been Enlightened, even more so after the Enlightened captured his shards during the Abaddon Anomaly in New Taipei City. Due to the overall RES victory, Oliver has awoken as a Enlightened-leaning Simulacrum and now he is out in the world. Following the end of Obsidian, it was revealed that Lynton-Wolfe was working alongside the Acolyte to activate the Obsidian Shield. After witnessing its disastrous results on the Portal Network, both began to work towards a solution before Jahan did. Lynton-Wolfe had revealed of a series of Power Cube stockpiles around the world that could be opened and cause Power Cubes to enter the network en mass. He would require both the assistance of Agents worldwide in uncovering a Glyph Sequence that could open the stockpiles and ADA’s help. 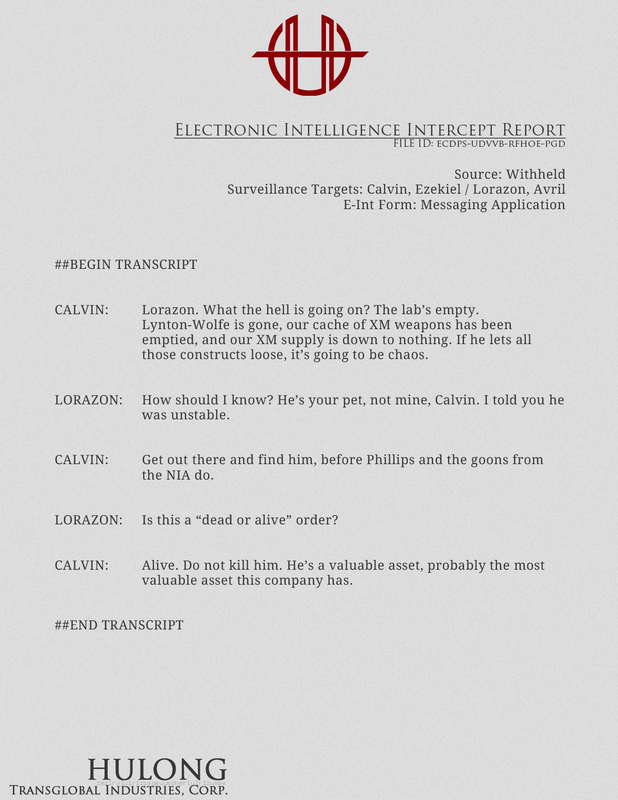 On April 12th, 2016, Oliver confirmed that the stockpiles had been opened after Agents assembled the Sequence. Moving forward with his research, he then launched the #GlobalPortalSurvey: a worldwide challenge to study a series of Portals using a series of specific Glyphs. Agents immediately met the challenge head on. On April 26th, reports began pouring in that the Acolyte’s compound was attacked by unknown forces and that Oliver had disappeared during the chaos. Intel recovered in San Diego revealed that ADA had organized the attack and gave Oliver the chance to escape. The intel also revealed that the stockpile he had released was actually stolen from all the XM Corporations and the NIA. Oliver would begin to go after the research of Susanna’s father, Nigel, which would lead him into building the Tecthullu. He sought its power and wanted to control it. Susanna and Klue appeared, potentially to stop them, and as a result they were absorbed into the machine. OLW managed to activate it and synchronize with it but the activity from the Nov. 12th Anomaly caused him to have some sort of falling out. He is now in hiding.